The Hon’ble Finance Minister Shri. Arun Jaitley announced a host of changes in the Indirect tax structure in the Union Budget 2016-17 on February 29, 2016, that are expected to impact the Trade and Industry. Under Service tax, on one hand, the effective rate of Service tax would go up to 15% w.e.f June 1, 2016 with the introduction of Krishi Kalyan Cess at 0.5% on the value of all taxable services, on another hand, some of the exemptions, which were hurriedly withdrawn during the last two years, have been reinstated with complete clarity & refund mechanism. Further, there are many changes in the Negative list, Exemption list, Reverse Charge and Abatement Notification also. 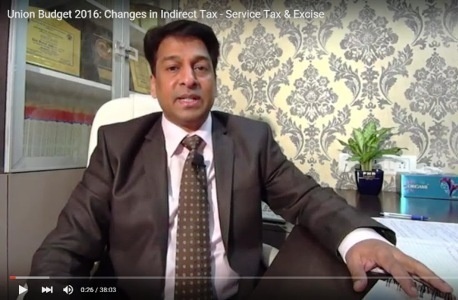 As an endeavour to summarise all the important changes in the arena of Service tax for easy digest, Mr. Bimal Jain has recorded a video titled “Union Budget 2016: Changes in Indirect Tax - Service Tax & Excise”, discussing the flurry of changes proposed by the Union Budget 2016-17 and their likely impact. You may watch the video presentation by clicking the following link. Continuing with our initiative, We invite your suggestions on the indirect tax proposals of the Finance Bill, 2016 for consideration and inclusion of the same in the Post Budget Memorandum to be submitted to the Ministry of Finance. We request you to submit your valuable suggestions latest by 7th March, 2016 at service@a2ztaxcorp.com." Whether the provisions of Section 40(a)(iii) disentitles an assessee to claim a deduction on account of Salaries paid to its employees, if the tax is not paid within the specified time but is paid subsequently? The assessee was non-resident banking company and its principal place of business was situated outside India. The Assessee transferred some of its Employees from overseas to its branches in India for the business carried on in India. The Assessee claimed deduction and TDS was deducted on the remuneration that was payable to the expatriate employees in India. The Assessee's head office situated overseas also made certain payments to and/or for the benefit of such expatriate employees. However, the Assessee did not account for such payments, which were in the nature of salaries, allowances and perquisites, in its Profit and Loss Account and also did not deduct TDS on it. However, in pursuant to the CBDT Circular No.685 dated 17/20th June, 1994, the Assessee deducted and deposited TDS pertaining to the payments made by HO from overseas for the benefit of the employees serving in India alongwith interest due thereon, with the Income Tax Authorities. The Assessee sought to claim a deduction of an amount of Rs.1,32,46,994/- in respect of remuneration paid by HO. However, the CIT(A) rejected the Assessee's claim by holding that such claim could not be made in appellate proceedings. The ITAT held that since no tax had been deducted at source under Chapter XVII B of the Act within the prescribed time, no deduction under Section 40(a)(iii) was permissible. A plain reading of Section 40(a)(iii) of the Act, as was in force, during the relevant year indicates that no deduction would be allowable in respect of any payments chargeable under the head “Salaries” if (a) the same are payable outside India and (b) if tax has not been paid or deducted thereon under Chapter XVII B of the Act. The added condition that the tax must be deducted and paid within time, cannot be read in Section 40(a) (iii) of the Act. The plain language of the Section 40(a) (iii) does not permit such interpretation. It can hardly be disputed that the tax deposited by the Assessee was in discharge its obligations, as imposed under Chapter XVII B of the Act. That being so, the Assessee had also overcome the rigor of sub-clause (iii) of clause (a) of Section 40 of the Act as the necessary condition for applicability of the said provision, that is, non-deduction and payment of TDS under Chapter XVII B of the Act, no longer held good. Having complied with the said obligation, the Assessee could not be denied the deduction which was otherwise allowable under Section 37 of the Act. Whether provisions of Section 263 of the Income Tax Act, 1961 can be invoked only in the cases of lack of enquiry by the Assessing Officer and not in the case of inadequate enquiry by the Assessing Officer? The ld. AO raised the queries, during the assessment proceedings, on all the points on which objection had been raised by ld. CIT in the notice u/s 263 of the Act and replies were also submitted by the assessee. It was held that this is not a case of lack of enquiry by the ld. AO or lack of application of mind by the ld. AO. Merely because the ld. AO has reached to a different conclusion and ld. CIT has different conclusion, the assessment order cannot be said to be erroneous and prejudicial to the interest of Revenue. Therefore, revisionary power u/s 263 of the Act cannot be invoked by ld. CIT. Reliance was placed on the Judgement by the Hon’ble Allahabad High Court in CIT vs. Krishna Capbox (P.) Ltd.  372 ITR 310 (All.). "Information Return by RBI and Electricity Companies: Precaution to be taken by Manufacturers and Service Providers/Receivers"
but if we listen, we may learn something new"